My first time watching Iyanla Fix My Life was on 5/20 (yea yea I know), when she attempted to fix the lives of a mother and her six children. For the sake of spoilers, I won’t go into a long detailed account of everything I saw, but I will say that they had a host of deep issues that left me wondering if they would ever find the path towards forgiveness and healing. I sat on my couch, phone in hand along with my fellow #BlackTwitter family as we hashtagged our way through this episode of drama, with our mouths gaping open in shock at all the tea being spilled. This was pretty interesting quote and I have to say it stuck with me for some time now. I took some time to really think about how much I had done the very thing this daughter was trying to do with her mother; make her understand and feel what she had gone through, even when it was clear that her mother was going to disagree with her at every turn. When reflecting on my own personal experiences with this, I had learned the hard way that just because I was experiencing something in my life and had my personal emotional opinion about it doesn’t mean that everyone is going to be on board with me. Sometimes, you are going to be alone in your feelings. There will be times that you will not have a soul who is for you and how you feel, and you have to be ok with that. Your goal is not to badger and fight your way into people seeing your point. Your goal is to not push and project your emotions onto others. The best thing you can do is express to someone how you feel, and hope that they understand and can provide some level of empathy, but it doesn’t mean that they will always agree. Focusing your attention into making someone understand how your experience was with something may not give you the desired result; because oftentimes, we want that person to feel how we felt, understand our anger/rage/sadness; and sometimes, they still have no remorse for us. So what have you gained in all putting all that energy in forcing your experience onto someone? Not. A. Thing. 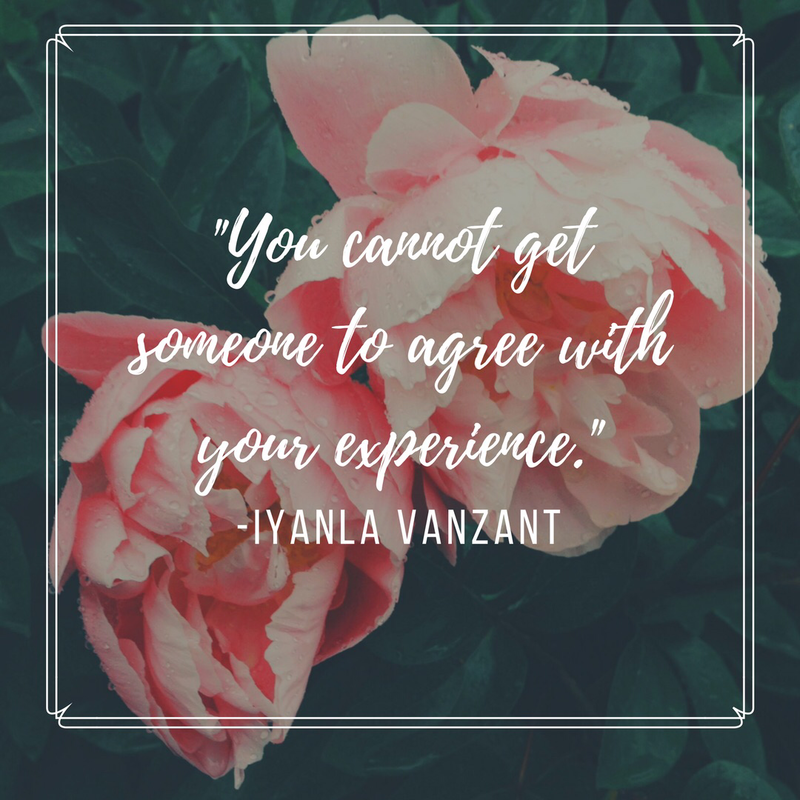 I notice that sometimes Iyanla may not always have the best approach to delivering her mesage, but on this episode, she spoke a word to me, and it’s something that even in my own life I have to remember to carry with me at times. You have to remember that people will not always agree with what you’ve been through; you can only pray that the person you reach out to for comfort is willing to show empathy and understanding to your situation. This weeks highlight for self-care is one that not all of us may love, but know is very necessary; exercise! Lol! Exercise is not only critical to improving your self-care, but it’s also beneficial for your overall health in general when paired with healthy eating habits! Exercising is actually one of my favorite things to do now, and if I don’t start my day off with a good workout, I know my day is bound to not be the best it possibly can be. These things and others are just small steps towards ways to enhance your daily self-care regimen. This week, try incorporating something you enjoy doing into your self-care routine as it relates to fitness, as an effort to improve your overall health and well being! As you can see in the picture, my attempt is to show that I have two different sides of myself. I believe a lot of us in this world live in this same reality. First, we have the professional side. This is the side that puts on a bright smiling face, shows up to work and does the job that needs to be done. For some people living on side A, there’s little to no foolery going on at the job, and coworkers no very little about your social activities and your personal life after you take off your ‘professional’ hat. A lot of us live most of our days at work, so these are some of the people that we spend a good chunk of our time with, so they may perceive this to be our ‘normal’. It’s rare or almost impossible for them to see how you are on a Friday night-Sunday evening, and if they do, it might shock them. Like I said, most of us live two different lives; and if you’re like me, sometimes it gets hard for others to balance or even understand that you have to change your personality to fit into your professional realm. I heard a discussion about this once, and they called it duality. I realized that this might be a little bit of something I’m going through right now. Sometimes I feel like I am living in two different worlds. I have a hard time balancing my personal life with my professional life, because I am very much a millennial. I am very much into social media, very much into wanting to be social and fun. I understand that I am not going to make some of the immature and irresponsible decisions I made in college now that I am an adult; however, I do know that some of the things that I do now are things I wouldn’t want my coworkers to know about in my professional settings. As I continue to navigate through the murky waters of professional adulthood and my passionate side hustle of being a creative, I guess I will be also finding ways to define myself in both of these worlds as well as learning how to be my most authentic self in each one. One thing I have learned is that respect and honesty hold true no matter what area of life you’re in, and people will value you a lot more when you’re honest about who you are up font instead of trying to be someone you’re not. So, here’s to all of us working our way through our duality. May we find a way to live and love both lives at once, Lol!!! The park and I met up yesterday. 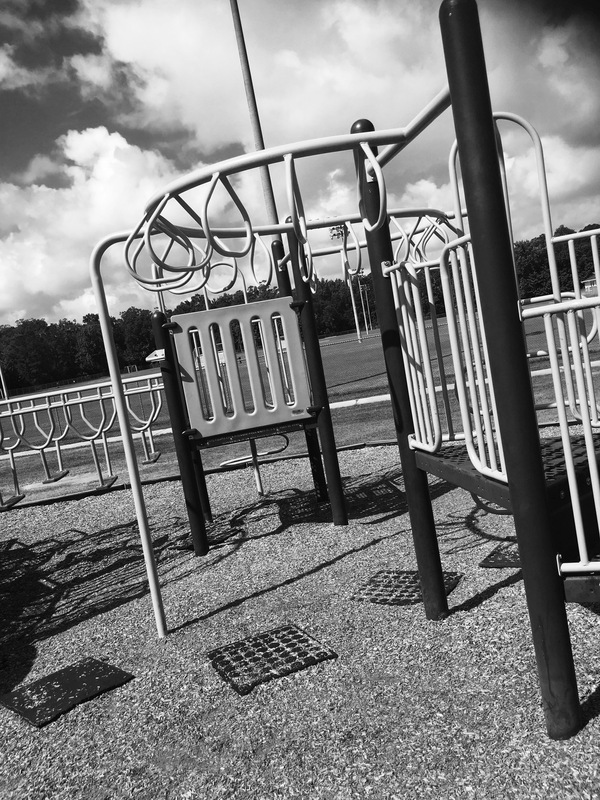 I remembered how fun it could be for adults. I promised I’d come back and visit more often this summer. How many times do you say no to someone when you don’t want to do something? Are you the person all of your friends and family go to, because of your innate ability to always tell them ‘yes’? We all inherit this nasty habit, don’t we? We say yes to things we really don’t want to say yes to; sometimes, even before we can catch our lips to form the word. We get sucked into commitments and promises we know we don’t want to keep; and why? Because we are afraid of one simple answer, NO. Now, I’m not saying that our friends and family are intentionally mean and hateful towards us if we tell them no; and I am not saying that we are saying yes to every single thing because we truly fear telling them no. There are plenty of things that I understand and am comfortable saying no to. And my family members are aware and comfortable with me saying no to them if there is something I cannot do. I am speaking from a place where if you are in a situation where you are NOT comfortable in your life with telling the ones you love or your friends no, and there is hesitation in you telling someone this. Let me tell you: SOMETIMES, YOU NEED TO SAY NO! Most times, people don’t understand that in order for you to be ok, sometimes you need to say no. You need to take a break from helping others, and take times to help yourself. It may not always be your first choice, but it may very well be a sacrifice or requirement of you. And sometimes, when you have to say no, you end up being glad you did. Saying no can sometimes be a life saver for you, and it shouldn’t be looked at as judgmental. Everyone on this planet has the equal right to say no to things they don’t want to or don’t feel comfortable doing, and everyone’s comfort level is different. For someone like me, I am always in a position that I am willing to give every ounce of myself to someone else before I leave anything for myself. Because of this, when someone asks me something, I tend to tell them yes every time, even when I possibly should tell them no. This week, take the time to focus on whether or not you truly should take on as much as people ask of you. Ask yourself, “should I really say yes to this, or can I say no?” Give yourself a break and say ‘no’ for once and give yourself a rest. *REBLOG* Still a very interesting question…and one of the most interesting movie endings I’ve seen in a while! Robert was dating Mita at the beginning of the movie. Well, Robert lost his job, and his woman because she was a gold-digger, and not the sharpest pencil in the bunch if you get what I mean. Mita moved on to Robert’s boss, in which she drained him financially, and was willing to give up the company in order for Robert to take Mita back. Needless to say, his boss was stuck with her. In between all this, Morgan had met Robert, and they had become very interested with each other. Have you ever gotten into an argument or disagreement with someone, and found yourself trying to push your feelings or emotions onto another person; and continuously gottten upset when they don’t see things your way? Or did you want someone to feel the same way you felt about something, so you decide to try and push whatever agenda or feelings that you have about a situation on them so they can feel just as sad at? If you have felt this way before, then it’s safe to say that you may have been projecting your negative vibes onto other people, and that’s not what’s up, friends. So, let’s dissect this, shall we? What does it mean to project anyway? The definition of project is to transfer or attribute one’s own emotion or desire (another person) to, especially unconsciously. Which means, whenever you’re feeling, jealous, angry, sad, upset, insecure, fearful, anxious, etc. you can project these emotions onto others around you, and allow them to feel the same way. So, I’m sure you’re asking yourself; what would make someone want to project their negativity onto someone else? I believe its because it feels good to us. The truth is hurtful and we don’t want to be exposed to any parts of it by ourselves if we don’t have to be; so instead, we decide to push our feelings and insecurities off on people so intensely that they begin to feel as if they are theirs as well. Before we know it, we have projected some negative vibes into the atmosphere and the reality of the situation is, we are still wallowing in our feelings alone, and all we’ve done is pissed some innocent people off in the process. Do people find it easier to project their emotions onto others? Does it give them a sense of relief? I believe for some people, it does. I think for some, it serves as a defense mechanism. If they are able to take that feeling and pass it off to someone else, and feel as if that burden is no longer theirs, then they are no longer worried or concerned. Do you consider how you’ve affected someone else emotionally with your negative projections? I will admit that I have attempted to project my emotions onto someone in the past, and I was called out on it. There was a discussion about it and the air was clear. After that, I was able to recognize how I contributed to that, and I do my best to not project on others. I have learned from my mistakes (because I’m human enough to admit I am not perfect and I have done this before), and I work hard not to do it again, because it is not a good thing to do to anyone. Is it possible to project positive emotions? The last question was actually one I got listening to a podcast, and it made me think. I don’t believe there is a way that you can project positive emotions, by definition. If I am attempting to transfer my emotions onto someone else, I am basically trying to force the way I think, feel and believe onto someone else; which could be possibly setting myself up for disappointment in the long run. I feel like your intentions may be good; however, the overall intent will still be lost, and in the end, someone will end up on the losing end of it either way. How can we prevent negatively projecting our emotions on others? One way I see doing this, is fully accepting our own emotions, and working through them like big girls and big boys should. There are far too many instances when we project negatively on others, just to deflect what we truly want to feel and process ourselves, and that not only is unfair, but it’s also very toxic to spread that kind of negative energy around to others. The best thing to do, is to begin to own up to whatever emotions your feeling, and learn how to deal with them as an individual and move on so that you don’t have to allow anyone to be subject to your projections.